Alex Mack #51 of the Atlanta Falcons walks off the field after beating the Dallas Cowboys at Mercedes-Benz Stadium on November 12, 2017 in Atlanta, Georgia. Quinn says it is Mack who helps set a tone within the locker room. 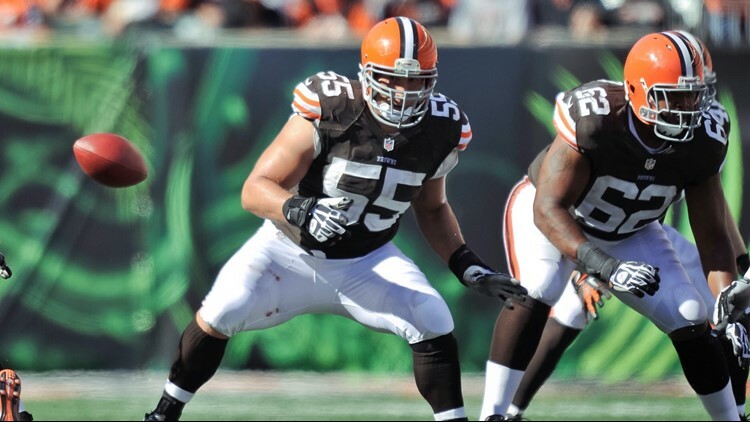 Former Cleveland Browns center Alex Mack found a new home three years ago when he joined the Atlanta Falcons in free agency, and that one move sent a wave of positive ripples throughout the organization. According to Falcons coach Dan Quinn, it is Mack who helps set a tone within the locker room. Following the 2015 season, Mack exercised an opt-out clause in the five-year contract he was forced signed with the Browns after they matched an offer sheet he agreed to with the Jacksonville Jaguars during the 2014 offseason. The 2014 season came to an abrupt and premature end for Mack when he suffered a broken leg in a 31-10 win over the Pittsburgh Steelers at FirstEnergy Stadium, but the road back from the year-ending injury, which included other damage rather than just a clean break, ended with his third selection to the Pro Bowl in 2015. Alex Mack #55 of the Cleveland Browns snaps the ball from center against the Cincinnati Bengals at Paul Brown Stadium on September 16, 2012 in Cincinnati, Ohio. And that would not be the only time Mack suffered a severe leg injury, as he played Super Bowl LI on a broken left leg. “His ability to take it further is one of the things that I admire the most about him,” Quinn said. “We have a time after practice, we call it, ‘Plan B.’ It is just development time for our players. Every day, he is at the front and center of that trying to find little parts of his game to get better and to get working at. Falcons quarterback Matt Ryan has found a resurgence in his consistency during the 2018 season, and Quinn attributes some of that success to players like Mack, who will return to Cleveland for Sunday’s game against the Browns at FirstEnergy Stadium. “I wish that you could come here to see the way that he puts in the work to prepare,” Quinn said of Ryan. “His consistent play really stems from all of the work that he puts into the week. The guys here totally believe in him, rely on him, because he is so consistent.